The ingestion and entanglement causes by marine debris has adverse affects up the entire food chain through direct and indirect effects. Studies have shown that it is a commonality that animals such as sea turtles and seabirds will ingest bits of plastic and trash for food. The ingestion of this debris has a whole host of adverse effects: reducing the absorption of nutrients in the gut, reducing the amount of space for food in the animals stomach, the uptake of toxins by the animals, ulceration of tissue, and mechanical blockages of digestive processes. Not only are organisms being harmed by eating the debris, the debris can physically harm varying species as well. In a process that is known as “ghost fishing”, fishing equipment will continue to catch and lead to the eventual death of ocean creatures. This discarded degree can also damage that very necessary coral and seagrass. The trash also has different indirect effects on organisms. An example of this is when the collection of trash on the surface blocks the sunlight that autotrophs depend on for sustenance. The ripple effect of this stems from autotrophs being the very bottom of the food chain meaning that every other organism indirectly depends on the sunlight derived energy of autotrophs. The small pellets of plastic awaiting their final shape can often fall into the ocean on their trek across the oceans. These plastics known as nurdles have a high ability to absorb toxins from the environment and create toxic snacks for organisms. The plastics are known to absorb the PCB and DDT toxins that naturally occur in the environment. Once these pieces have been eaten by different organisms, the toxins work their way up the food chain and eventually onto the plates of people. These organic pollutants are linked with dangerous effects such as reproductive, developmental, behavioral, neurologic, endocrine, and immunologic adverse health effects. With 1.5 billion people having fish as 20% of their animal protein intake, this puts them at serious risk of the adverse effects mentioned. Even further down the line, these toxins can be transferred to unborn and young children through the placenta and breast milk. Along with the indirect health risks, the physical trash, including things such as medical waste, can find ways to harm beachgoers and swimmers. 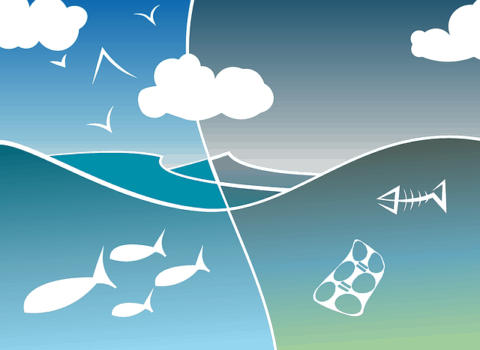 Garbage Patch Environmental and Human Impacts by William is licensed under a Creative Commons Attribution-ShareAlike 4.0 International License.